Brian Geoffrey Chadwick was born at Crewe in Cheshire, England, on 31 January 1915. This was during the early months of World War I while the British and French forces were settling into trench warfare after the first battle of Ypres. His mother was Clara Louise Chadwick (nee Smith) and his father, William Edwin Chadwick, was a stationery manager who later had several different occupations, including that of an advertising agent and printer. There was one older brother, Bernard Smith Chadwick (1913- 1996) who, like Brian, served in the RAF during World War 2, later worked as a commercial photographer and owned some land that he leased to Pinewood Studios. During the years 1922-1930 Brian was educated at Margate College in Kent and at Ashford Grammar School. While at Grammar School his sporting interests included tennis, swimming, badminton and hockey. He belonged to the Church of England. As a teenager Brian liked reading, a keen interest that stayed with him all his life. At school he also learnt German, and was a member of the School Cadet Corps. Influenced by his father's varied work, Brian developed a good mechanical aptitude from an early age so it made sense when he left school in 1930 to train as a printer. 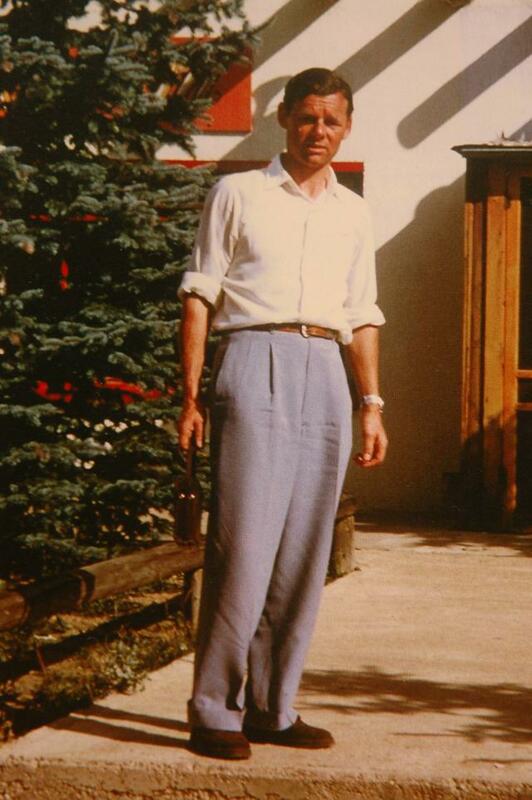 In spite of the global effects of the economic depression he had a happy youth and loved working with motor bikes and cars. He also spent time tuning and testing motor engines for publicity purposes in his father's business. On 9 April 1938, aged 23 years, Brian married Sylvia Mary Grieve at St Saviour's Church in Paddington, London. Sylvia was 21 years old and her parents lived in South Lambeth Road, London. Brian and Sylvia honeymooned in Europe and travelled around by motor bike, but with the increasingly tense political situation on the continent, the Union Jack displayed on their motorcycle was spat on several times. Their first child, Anthony 'Tony', was born in March 1940 at Bushey Hospital in London. Later that year, after Brian had enlisted in the RAF, they moved to Slough, and when Brian served overseas, Sylvia and Tony remained there for the duration of the war billeted with a caring elderly couple, Mr and Mrs Bicknell in Sutton Ave.
With the onset of World War II, Brian Chadwick, like most other younger men, faced a choice of which service to apply to join. He eventually passed aeronautical engineering examinations for entry into the RAF Volunteer Reserve and on 28 April 1940 was granted "a commission for the duration of hostilities as Pilot Officer on probation" and was allocated Service Number 78813. He undertook aeronautical engineering training, transferred to the Technical Branch, and was promoted to the rank of Flying Officer in April 1941. While Chadwick's work in the RAF was focused on engineering (No. 71 Maintenance Unit) he also did some flight training from December 1941. Soon promoted to Flight Lieutenant he continued occasional flying, mostly around the Heston area in 1942 and 1943, with instructors from Nos 302, 303 and 316 Squadrons (all formed by Polish personnel in 1940/1941). Training was on Magister, Tiger Moth and Cub aircraft. Brian Chadwick was posted to India in late 1943 and at the same time promoted to Acting Squadron Leader. In 1944 Chadwick met Peter Proctor, a young Pilot Officer flying Harvard, Hurricane, Spitfire and Thunderbolt aircraft. Proctor had been born at Newcastle-upon-Tyne in November 1923, joined the RAF in 1942 and was sent to South Africa for his flying training, gaining his wings in November 1943. He and Chadwick became firm friends, and later worked together in civilian life in England before emigrating, with their families, to New Zealand. In early October 1944 Chadwick flew as a passenger in a Tata Airlines DH89 Rapide on the Trichinopoly to Bombay route in two flights totalling eight hours flying. It was this type of aircraft he was later to become synonymous with in his New Zealand flying. Chadwick's last RAF flight was at the 'controls of Tiger Moth NL720 on the 11 July 1945, with Proctor as passenger, although he continued serving in India until December of that year. His RAF service in India was an exciting and happy time and he often fondly recalled those days. In May 1946 Chadwick returned to civilian life and was granted a commission in the training branch of the RAF Volunteer Reserve. This meant he still had regular associations with the Air Force and on 14 September 1946 he did some flight training, with Peter Proctor, at No. 21 Operational Training Unit based at Moreton-in-Marsh. 1951 found the Chadwick family on their way to a new life in New Zealand, hopefully to Hamilton where Brian expected to get a flying job with James Aviation. However Chadwick was not impressed with the idea of using Tiger Moths for top dressing, so they moved to Christchurch where he eventually got a job with Airworks NZ Ltd.
Over the next few years Chadwick gained his commercial pilots licence with instrument rating, radio operators and engineering licences in categories A and C.
Brian Waugh, another good friend of Chadwick's, emigrated from England with his own family after Brian Chadwick convinced him of how good it was here in NZ. 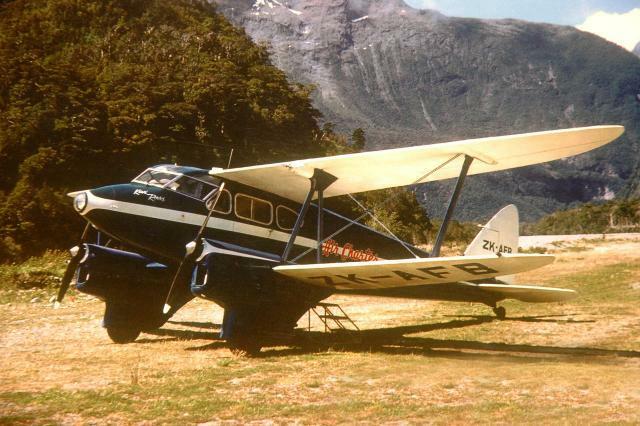 The two Brian's worked together for South Island Airways flying Dominies. In 1956 they both moved to Trans Island Airways and flew Dominie ZK-BBP. By 1959 Brian Chadwick had built the family home at South Brighton, Christchurch, N.Z. with his own hands, and he had formed his own Airline, Air Charter Ltd. 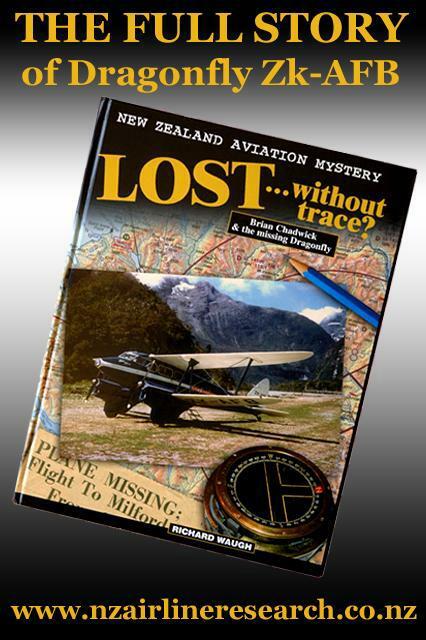 Using two elderly (even in those days) aircraft� Dominie ZK-BCP and Dragonfly ZK-AFB, he was flying Tourist Charter flights to Milford from Christchurch. 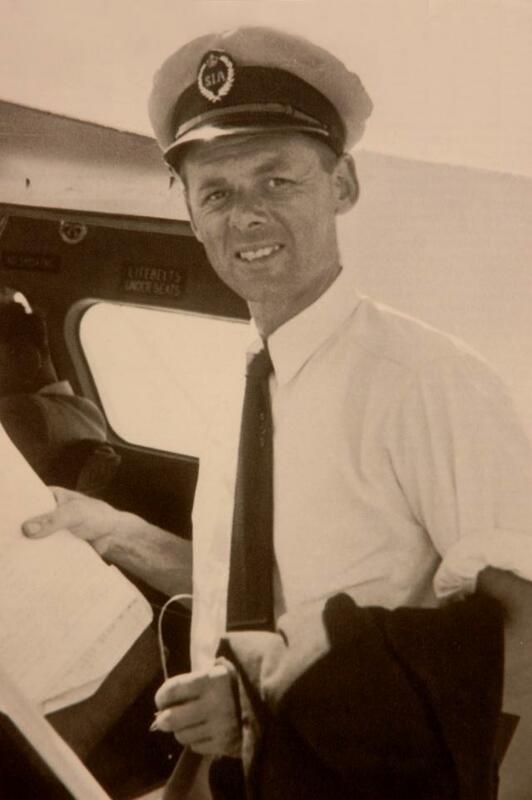 As owner/operator of the new airline, Chadwick was manager and engineer rolled into one. This meant he did his own repairs and did all the book keeping. Dominie ZK-BCP was his main plane. Dragonfly ZK-AFB was purchased in May 1961 for use as a backup aircraft since business was increasing. After flying 154 flights to Milford, Captain Chadwick's luck ran out. He failed to complete his 155th trip to Milford amid treacherous weather. The photos and text on this page have been sourced, with permission, from the book by Richard Waugh.